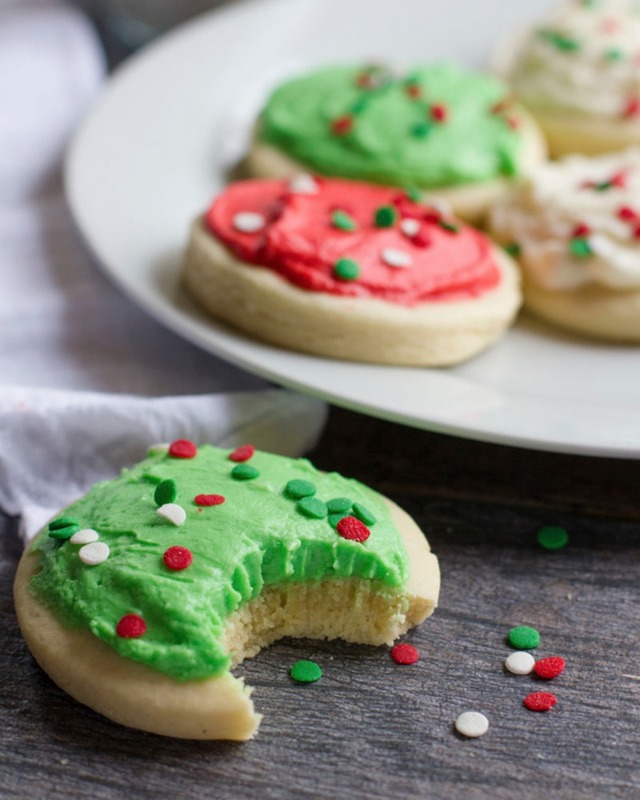 You know those AWEsome soft sugar cookies that you always want to buy at the grocery store but only cave in and devour once in a while… well you may not want to know this, but we have a recipe for those exact cookies!! Visit website for the full recipe! 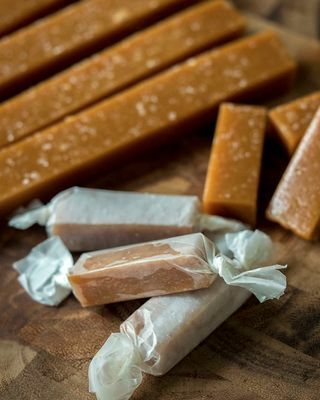 Salted caramel!! Could this season get any more cheery? Our mouths are watering just thinking of this tasty treat and now you can cook up a batch right at home! 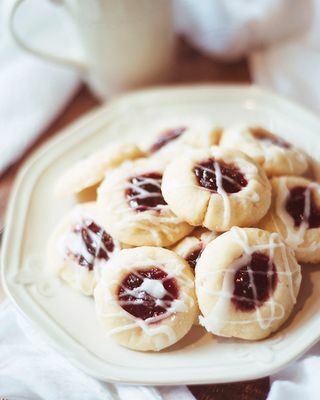 There is something very grandmotherly about these raspberry almond shortbread cookies. They feel like the kind of treat she would have waiting for you as after an afternoon of playing in the snow. Well now you can pass this tradition on to the children in your life… or maybe just keep them for yourself. 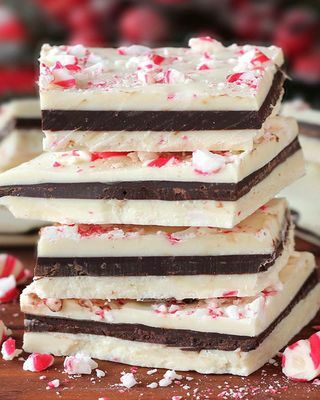 Alright you caught us, this isn’t technically a cookie, but needless to say peppermint bark is a holiday staple. How many times have you looked at a half eaten container of it and wondered who snuck in and stole all your delicious Christmas candy. Before you start interrogating your cat about this theft we have good news. You can make more! Lace cookies. We forget they exist 11 out of the 12 months in the year but when Christmas rolls around these delightfully thin creations drive us wild! If you haven’t tried these out yet, we have to ask you, why?? You should make this the first year and we bet you will be absolutely hooked! Need something to go with that hot cocoa you are sipping? 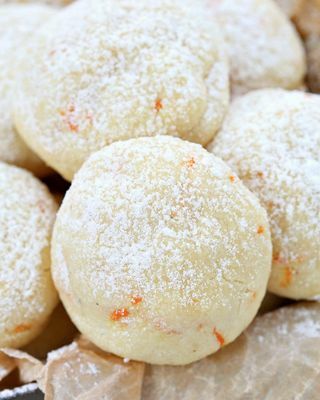 Let us recommend these old fashioned orange vanilla cookies. With orange zest to brighten up your taste buds and the soothing taste of vanilla bean you cannot go wrong this holiday season with these dainty looking cookies. We admit that we haven’t had these before but there is always a first time for everything. 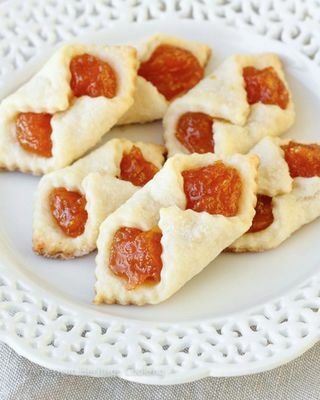 These traditional little Hungarian cookies look so cute and yummy we might just try them this weekend. From the homemade filling to the crisp sugar coating we can’t wait to start baking! Those Girl Scouts really have us trained. 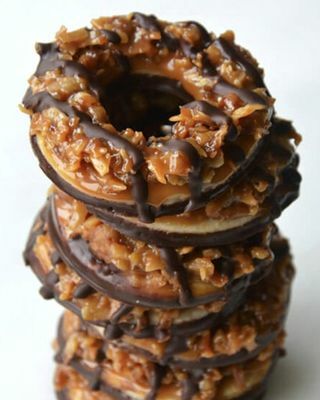 Who else craves Thin Mints or Tagalongs around this time of year? Don’t you wish you could just go to the store and pick up a box. Well now you can stick it to those Girl Scouts by baking up your own! These homemade Samoas look good enough to box up and sell at insane prices for people to hoard in their freezers for half the year. 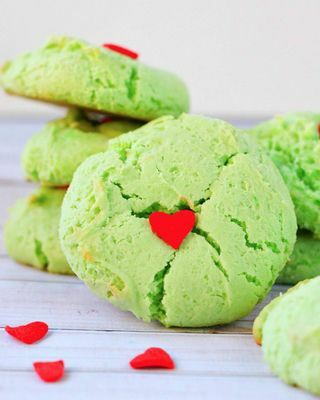 Bright green and a single red heart shaped sprinkle in the middle, these Grinch cookies caught our eye immediately. We know the kids in your life… and your child at heart will love these adorable themed cookies, Even if you do spend this season hating Who’s. 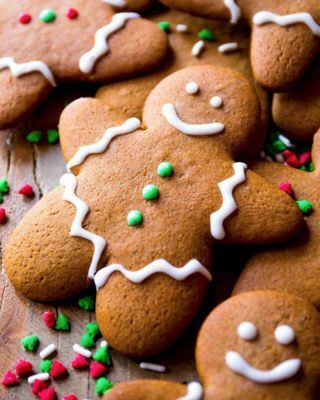 Gingerbread Men are classic. What holiday cartoon special is complete without a few of these guys sprinkled throughout, and what kid hasn’t loved decorating their own every year. 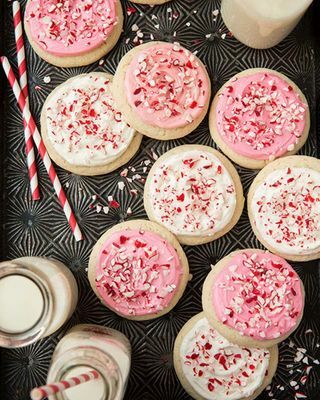 Classic holiday memories to go with a classic holiday cookie. Well you may love the look of gingerbread men, but sometimes the cookie isn’t all it’s crack up to be. 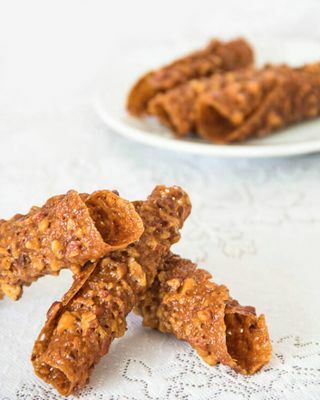 This recipe is hear to change that, soft in the center and crisp on the edges we want to gobble these all up right now! 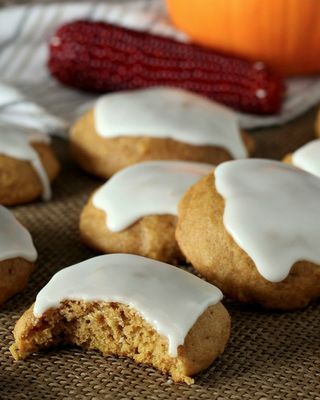 Our culture is OBSESSED with pumpkin right now, but for good reason, pumpkin spice is such a wonderful taste that we can’t help adding it to everything, But one thing no one argues against are pumpkin cookies. And Let us tell you these are some of THE BEST! 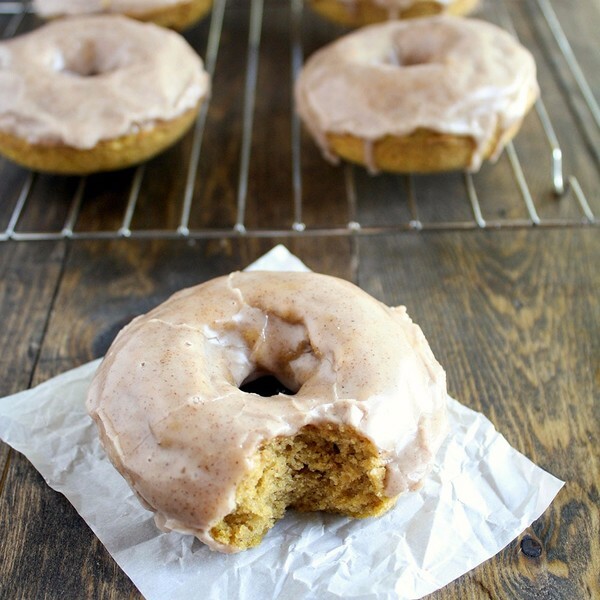 Thick and soft with a delicious glaze, sign us up for 4 dozen! Can you say heaven? We love eggnog and seeing it appear in stores gives us a little lift of holiday spirit every year! 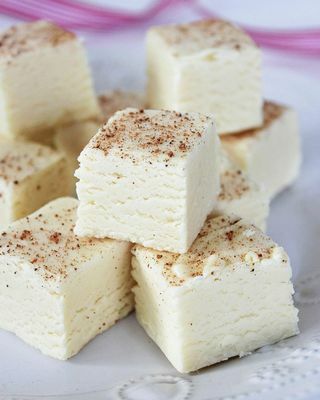 Now a few days ago we would have said their nothing you can do to make eggnog any more perfect, but that was before we saw this recipe for eggnog fudge!!! Waaaaaaaaaat? Heaven meet perfection! Dark chocolate AND cherry… we are listening. 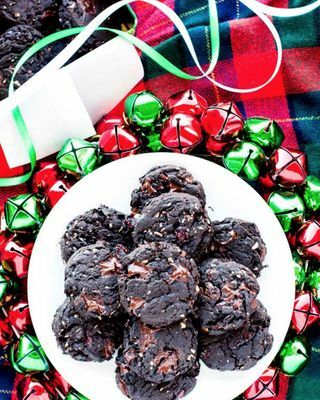 These dark little cookies have to be added to our list of things to bake soon. With some delicious potential we can’t wait to chow down on these next to a roaring fire while it quietly snows outside our window. These are a true remnant of our past as they always seemed to show up at holiday bake sales and christmas parties. 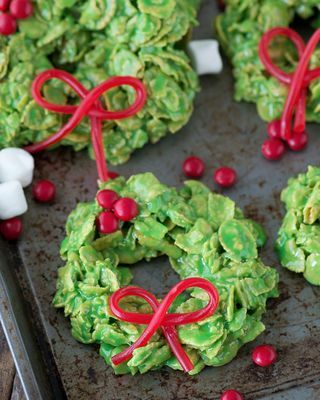 Simple enough most elementary school kids could help make these fun little wreaths, plus forget the frosting, decorating these suckers is a synch. These is a must if you have kids! 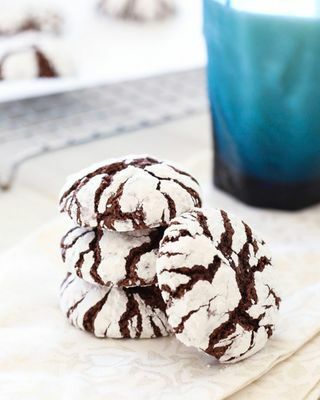 These chocolate crinkle cookies are always a crowd favorite at our house, but we also have nick named them funny albeit gross things like reindeer and/or snowman poop cookies. But whatever you call them, they will not last long. Chocolate cookies, okay. Dip them in chocolate ganache, go on! 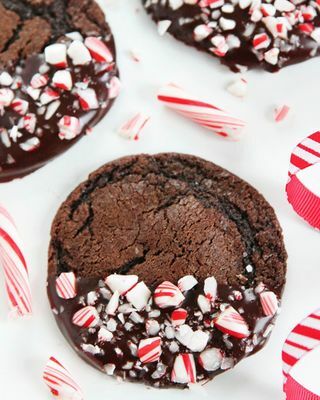 Sprinkle it with a generous helping of crushed candy cane, quit talking and start baking!!! Seriously, why has the oven not been pre heated yet!? Sweet Mary and Joseph! They have turned chocolate cheesecake into a cookie. There go all our dieting plans for the new year. 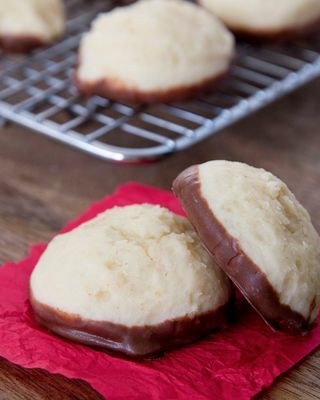 Not that we are complaining, these chocolate dipped cheesecake cookies look way better then the gym. Who here has had a buckeye before? We encountered them a few years ago and were blown away by the rich peanut butter and chocolate flavor. It was like a peanut butter cup had kick its game up 20 notches! 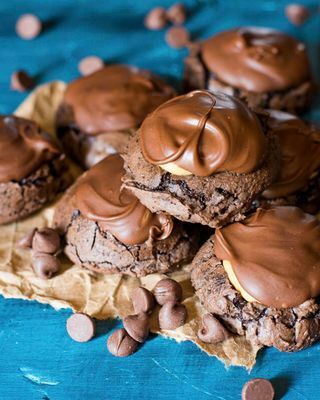 Now add that to a fudgy gooy brownie cookie and your heart is sure to flutter for a few minutes before is shuts down from the sugar overload! Now that’s what we call a cookie! If you could make your favorite pie bite sized wouldn’t you? Unequivocally YES! That’s why when we saw these apple pie cookies we just stopped and drooled for a few minutes. 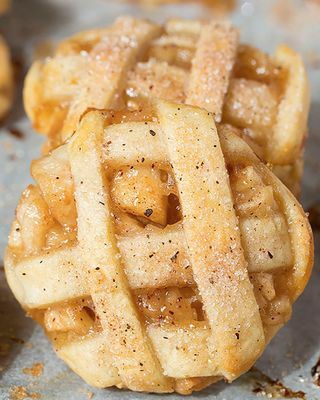 Not only are they so pretty with their classic pie lattice tops but they also won us over in the taste catagory!